There is some truth in the common saying that when you look good you also feel good, so this having been said, you should always try your level best to look good so that you are able to command the proper respect in your work place. 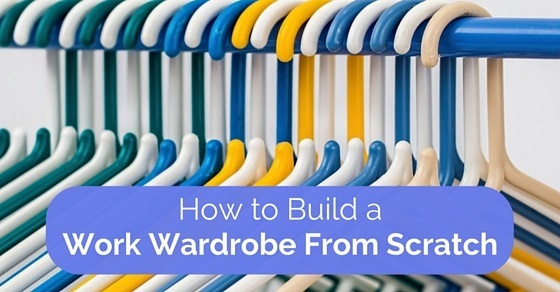 Building a work wardrobe from scratch is something which is certainly not easy at all, yet at the same time, what you ought to remember is that it is something which is certainly necessary to do. So here is a list to help you along the way if you have made plans to build a work wardrobe from scratch. When you set out to build a work wardrobe from scratch you cannot just walk into shops without even having an idea of what it is that you exactly want. So before doing anything else, you should sit down alone for a while and just jot down a few points pertaining to what type of garments you would like to purchase and roughly how many things would you like to buy. One of the worst mistakes you can make is buying too many clothes at one go, this is because fashion trends change very often and something which you may have liked last year might be something you detest wearing now. If you have an idea of your own likes as well as dislikes then you can go right ahead and start building your work wardrobe all on your own, yet if you are a little apprehensive about going about things on your own, then you should not shy away from consulting a fashion expert who can guide you along the way and even give you suggestions as well as valuable inputs. Consulting a fashion expert will come at a price, yet it is certainly worth the expense, rather than you making a big blunder and ending up with a number of clothes which you will never use. In order to purchase new clothes to build your work wardrobe, you have to know exactly what your size is. In addition to this you must ensure that at no point in time do you have any kinds of false images about your own vital statistics. It is often noticed in women, that they buy clothes which are either one size too big, hoping that they will lose weight soon and be able to fit into the clothes, though this never happens or on the other end of the spectrum, one size to big, because they are under the misconception that they are fatter than they actually are in reality. Building a work wardrobe with garments which you will use for office is a good thing, yet at the same time it certainly does not imply that you burn a hole through your pocket in the event of trying to look good and impress the other people in your office. As long as you look both neat, clean as well as presentable you are going to be given the respect which is due to you. This having been said, you should ensure that your actions speak louder than your words and that at no point in time do you become more famous for your garments rather than your work. In the event of wanting to build a work wardrobe, lacking in self awareness is certainly not going to take you anywhere. You should ensure that you know which colors look good on you and which colors you should stay away from. It is of paramount importance that you are always comfortable in your own skin as no matter what you wear if you do not conduct yourself in a proper manner or if you refuse to have your head on your shoulders then no matter what , you will never be able to get the credit which is due to you. So ensure that you have faith in yourself at all times. If you desire to build your work wardrobe from scratch it is vital for you to be well aware of what your body type is so that you can purchase garments which will suit you well and highlight those features in your body which are worth highlighting. No matter what your size is you should never think that you are inferior to anyone else, as if you conduct yourself with grace as well as elegance then you will automatically receive the respect of not merely your co workers but also your subordinates as well as senior. So focus on building up your self confidence before anything else. If you are at sea about where to begin from, you can always visit your nearest shopping mall to get an idea of what it is that is in fashion at the present moment. The more you look around, the better idea you will get about what it is that you should purchase. There are naturally a few staple things which you need to have, that you are prepared in the event of a sudden work picnic, business meeting, work related trip or even office party. Putting a little effort into your look can really go a long way in boosting your confidence and getting people to notice you. Being a person who is interested in fashion trends is a good thing but this certainly does not imply that you start wearing clothes merely because they are in fashion even if they are not suiting you or aren’t appropriate for work. Companies are always on the lookout for those employees who focus on their job primarily, before everything else, so ensure that you concentrate on your work before focusing on other less important things. This certainly does not imply that you completely neglect yourself. So ensure that you do not blindly follow trends but adapt them to suit your needs. As we are all well aware, branded garments are certainly not cheap at all this having been said, you certainly need not limit yourself to buying only branded clothes. If you know of a shop that sells affordable and good looking clothes then you should not shy away from purchasing a few garments from that shop even if they are not branded. As long as the clothes look good and make you feel good, you need not bother about any fancy names, brands or labels as things like this do not matter at all. It often happens that when people are trying to build a work wardrobe they get a little carried away and start purchasing things which they do not even need and probably will never wear. Experimenting a little is a good thing as it helps you look a little different and come out of your shell as well, but being outlandishly dressed in your work place is something which is certainly not going to go down well with your boss as well as your seniors. So remember that simplicity is the key when it comes to planning a work wardrobe for yourself. As we are all well aware, that the business world is a cut throat one indeed where we can call no one our friend, so in the event of needing some help, what you can do is ask your friends to come along shopping with you so that they can help you make decisions or even give their valuable feedback pertaining to what they think looks good on you as well as tell you when they think you ought not to purchase something. You can be rest assured that your friends will help you along your way as they genuinely care for you at all times and under all circumstances. After we come back from a hard day at the office most of us do not have the energy to make a trip to the mall or market, so in the event of wanting to build a work wardrobe within the comfort of your own home, all you need to do is browse through some online pages where you will be absolutely spoilt for choice. There are thousands and thousands of garments available in any and every size as well as color so you can order whatever you feel like and have it delivered right to your doorstop. When building your work wardrobe you must ensure that at no point in time are you purchasing clothes which are revealing or inappropriate otherwise chances are that you will lose the respect of the people who you are working with. If you go ahead and wear clothes which are too revealing then chances are that you are sending out wrong signals to the people who you are working with. So ensure that you know where to draw the line otherwise you run the risk of looking vulgar and cheap. Just because you have purchased an outfit in a particular way it certainly does not mean that you have to wear it exactly like that. You should be experimental and mix and match your garments so that you never come across as dull. When you mix and match your outfits then you start setting trends of your very own and this is something which will set you apart from the rest. Simply because you are dressing up for office, certainly does not imply that you have to dress in a boring manner. Many people prefer to stick to monochromatic tones for work, but this is something which you need not adhere too. So be as colorful as you like and you should never be apologetic for the way you dress. In the event of trying to build your work wardrobe, you should not simply focus on your clothes, you should ensure that you give equal importance to your accessories which include your bag, watch as well as jewellery. Last but certainly not the least is that you should ensure that the clothes you purchase are not merely good looking but also comfortable as well as durable. It would be advisable to not purchase clothes which would require too much care as well as attention otherwise you will have to waste a lot of time as well as money in the upkeep. So shop sensible and you will be able to create a good impression in the mind of everyone who you meet at your work place. So these are some of the tips which you can keep in mind when you are thinking of planning to build your work wardrobe from scratch. Ensure that you do give significant time; energy, money as well as thought into planning your wardrobe properly as if you do not do then chances are that you might not be able to build for yourself a suitable set of clothing which is absolutely appropriate for your work. Remaining a relevant part of today’s twenty first century business world is no easy task at all, so you must ensure that you always put your best foot forward.